The best techniques for weight gain don’t always take busy lifestyles into account. Having larger portions at meals, eating more often during the day and incorporating avocado, healthy oils and whole grains into your regimen are sound strategies for weight gain, but sometimes you’re on the go. If you’re looking for a bar to help you meet your caloric goals, choose one that’s high in quality ingredients or consider making your own. Following the general principles of weight management, you need to create a calorie surplus of roughly 3,500 calories to gain 1 pound. That amounts to 500 extra calories a day that you don’t burn off through aerobic exercise. However, people gain – and lose – weight differently, so it’s a good idea to consult a nutritionist or dietitian to craft a plan specifically for you. Depending on why you need to gain weight, a nutritionist may devise a regimen that has you putting on pounds more slowly, with an extra 250 calories a day. If your diet was less than ideal before you lost weight, you may think you can just add plenty of indulgent, high-calorie foods like french fries and fatty desserts to achieve your surplus. While those foods certainly provide calories, they don’t contribute essential nutrients to your diet, like lean protein, which helps build muscle. Over time, a diet high in sugar, refined carbs and other empty-calorie foods may make you heavier but also take its toll in the form of metabolic disorders. When choosing a commercial bar, be sure to scan the nutrient information and ingredients list first. If you’re replacing a sit-down meal with a bar, you’ll want a higher calorie count – at least 300 calories – but some bars have as few as 140 calories, according to a Consumer Reports analysis. A bar with the desired calorie count, however, may come with a price in terms of additives. Like any processed food, commercial bars often contain a lot of substances whose names you can’t pronounce, or additives like partially hydrogenated vegetable oil – a trans fat linked to cardiovascular disease. They may also feature chicory root, a type of added fiber that can cause stomach distress. Your best bet is a bar with whole-food ingredients like nuts, seeds and dried fruit at the top of the ingredients list as well as natural sources of healthy oils, fiber and protein. Artificial sweeteners in bars won't assist weight gain and may cause you to crave more sweet foods. Bars that are best for weight gain get their sugar from natural weight-gain sources like dried fruit. Quality protein helps you build muscle instead of fat as you’re gaining weight. However, there is no benefit to eating more protein than you need, says the Academy of Nutrition and Dietetics. That amounts to between 10 and 35 percent of daily calories, or roughly 46 grams of protein for women and 56 for men. If your weight-gain diet includes three squares a day that each contains a healthy source of protein, like fish, poultry, eggs or beans, you don’t need to look for extra protein from a bar. But if you’re on the go and need to get some of your daily protein from a snack, look for bars with fewer than 30 grams of protein in a serving. In one study, 30 grams of protein at a meal was just as effective for building muscle as higher amounts; the results were published in the Journal of the American Dietetic Association in 2009. The best weight-gain bars list healthy sources of protein, like nuts, seeds and whey protein, as their main ingredients and avoid heavily processed fillers and protein-boosters, like soy isolate, in the ingredients list. Weight-gain bars can run several dollars apiece. In addition to the cost, commercial bars are basically processed foods, which you should limit in your diet for best health. You can save money and get portability at the same time with other easy-to-make weight-gain snacks. Create individual trail-mix servings of nuts and dried fruit, and keep them in baggies to grab when you’re on the go. 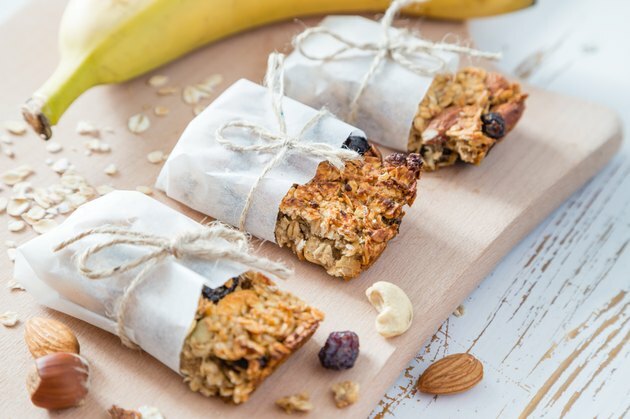 Or make your own weight-gain bars at home using nutrient- and calorie-dense ingredients like nuts and nut butters, seeds, quinoa, oats, dried fruits, shaved coconut and dark chocolate. Cleveland Clinic: Eating Too Much Sugar? The 7 Best Protein Bars and 3 to Avoid!